« Noona Wa Shong, Noona Wa Shong! Jirisan; the first of my last minute trips to see Korea before leaving this chapter of my life behind. Sejin-noona from BLU offered to take me along on a visit to her friend’s house near the Jiri Mountains in the southern part of Korea. Up until then I had almost exclusively been in Seoul with only a 2 day trip away from the city in the summer, not quite the great exploration that I had imagined but then again, this was possibly the most busy times of my life. Not enough time to have all the fun in the world! When we got on at the Nambu Bus Terminal in Seoul the weather was gloomy—not uncommon for this time of the year. The real surprise? Two hours later we awoke from a nap while arriving at a rest stop that was completely covered in snow. 우아! Though the trip was only three days long it felt as if much more time passed by. There is something about being in the countryside which seems to slow things to a crawl. Not only was the scenery different, but the people took time to move about at a comfortable pace which to the city boy that I’ve become was quite a shock. Sejin-noona’s friend was incredibly nice, as was her partner. Their house sits on the side of a mountain overlooking the valley below. 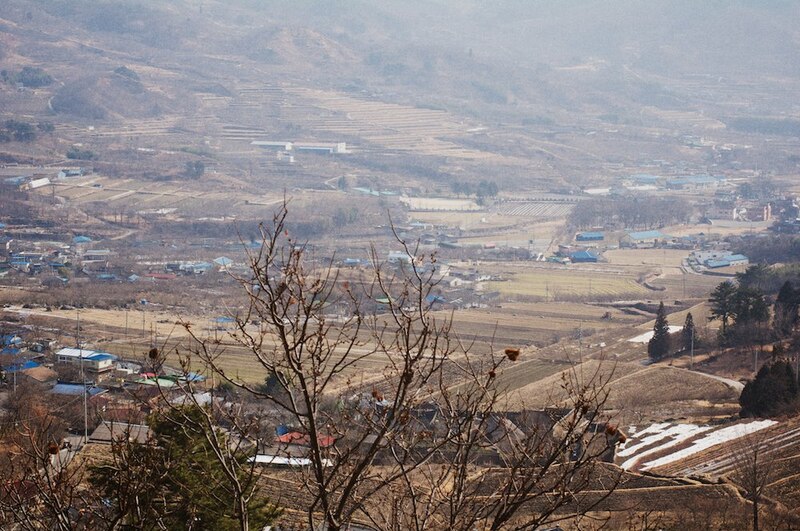 To be honest, the Korean countryside is much different than I anticipated. Somehow I thought it would be more lush and green, but I was greeted by a wall of earthy colors; grass that was brown (maybe just recovering from the winter?) and green trees relegated to the top halves of mountains that have become red after being terraced and made suitable for farming and living. Across the landscape were scattered houses here and there, some in a cluster that would constitute a small village and others sitting more idly by the road–all with their telltale blue roofs adding a flicker of color to the otherwise seemingly barren landscape. Amongst the adventures we went on were a stop in at a festival celebrating the first full moon of the new (lunar) year, a walk in and along a nearly dry river, watching men shoot pocket ball and then going to a wood carving artist’s home late at night, a visit to the construction site of Sejin-noona’s friends family’s new house (the photo above is taken from a hill above that house), and a trip to a clearing in a bamboo forest where another friend was building a traditional Korean home (한옥). The last escapade was more like a drunken, dizzy spin through a majestic wonderland that nearly swallowed me whole due to my overconsumption of makkeoli (막걸리) at lunch. I can say from firsthand experience that being surrounded by green walls of bamboo when you can barely get your bearings straight is a disorienting and bewildering (if not slightly uncomfortable) event. Everything was documented, just check the photos out on flickr! I hope to go back again someday, maybe with a bit more time to go hiking in the mountains and find more rhythm with the countryside. It’s refreshing to get away from Seoul, but I’ll never complain about a return to Hongdae. 아싸! My trip to Jirisan took place from 16 February 2011 – 19 February 2011. This entry was written by Jungho, posted on 2011-08-19 at 09:57, filed under 마지막 달 (The Last Month), 한국에 돌아 가는 길, Pt. 1 (The Road Back to Korea, Pt. 1) and tagged jirisan, korea, mountains, sejin-noona, travel, trip. Bookmark the permalink. Follow any comments here with the RSS feed for this post. Post a comment or leave a trackback: Trackback URL.